At the Crestline Piggly Wiggly are wine and beer experts Taylor Dye, W. Scott Atkinson and Thomas Warren. Journal photo by Jordan Wald. The Greater Birmingham-area grocery game is changing, and Piggly Wiggly Food Stores of Jefferson County co-owner Andy Virciglio, his father Stanley Virciglio and his partners Basim and Naseem Ajlouny are working to capitalize on those changes with renovations of the River Run store in Mountain Brook. According to Virciglio, business has been great, but it was time to re-work the interior and put more of a focus on those items that shoppers find on the perimeter of the store rather than in the aisles. Virciglio and his partners were looking to create a homier feel similar to the Crestline location in Mountain Brook and the new Dunnavant Valley store near Mt Laurel. “We had too much clutter and we just wanted to clean it up,” he said, adding that the team wanted the space to feel bigger once the work was completed. The renovation, which should be completed during the first few weeks of February, has included making the aisle space slightly smaller and shifting it farther to the left of the store to create more room around the perimeter for a larger fine wines and craft beer section and extended meat and deli space. “We’ve created a better traffic flow for the shopping pattern of the customer,” Virciglio said. For any regular shoppers who are worried about getting lost in a sea of rearranged products, the layout of the aisles has remained much the same. “Nobody likes change … so one of our goals was not to confuse people,” he added. New signage throughout the store has also been included to help shoppers navigate through the changes, but the crew made it a goal to keep the flow of product placement in the aisles as much the same as possible. What those big-box stores aren’t able to provide as efficiently as a local store is a curated selection of local and specialty products. According to Virciglio, the team is constantly looking for great specialty items – his oldest son, Austin, regularly attends food shows looking for new products – and, more importantly, listening to what customers want. The closing of Western Market locations could seem like a sign that the market is shrinking for local supermarkets, but Virciglio said he has seen growth at his stores. One of the great opportunities that has developed through the growth of perimeter sales has been the ability to offer jobs that capture the interests of a younger generation of workers. For example, Taylor Dye and Thomas Warren, who both work in the Crestline store’s wine department. 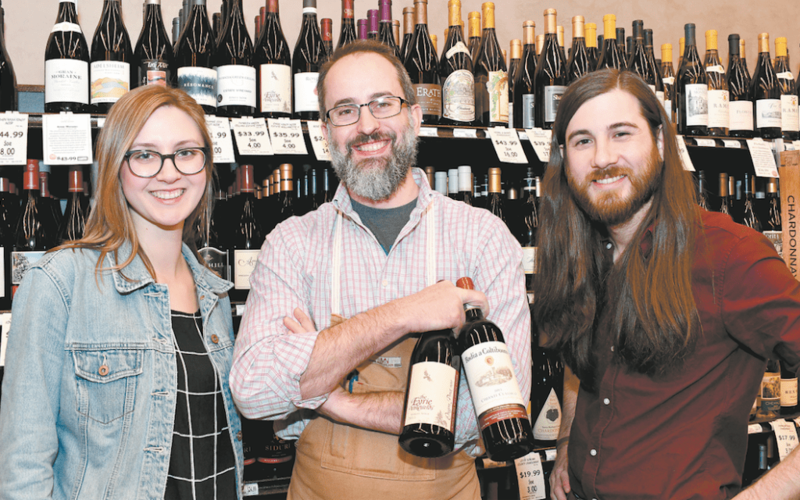 The wine department at the Crestline store recently grew, gaining W. Scott Atkinson, former wine director at Western Market in Mountain Brook who kicked off his 23rd year in the wine industry when he joined the Piggly Wiggly team on Jan. 26. Once Atkinson made the decision to join the Piggly Wiggly Crestline team, Virciglio said he was surprised to find out how many of his friends had been going to his friendly competitor, Western Market, rather than buying their wine at Piggly Wiggly. With Atkinson working alongside Dye in wines, Warren will have a chance to put a bit more of his focus on craft beers. “We want to become a destination for craft beers,” Virciglio said, add- ing that his son Andrew has been taking an active role in overseeing that area of the River Run store. It has been important to have great, knowledgeable personnel working perimeter sections like wine, beer and meats to provide better customer service. “We just hired a guy for our new store out in Mt Laurel, (Josh Lapidus). He just graduated from Auburn University, is as smart as he can be, in a meat science,” Virciglio said. With his bachelor’s degree in muscle foods production, Lapidus can answer just about any question a customer has about meat and seafood and keeps track of changing government regulations and guidelines regarding meat and seafood products. As the remodel of the River Run store comes to a close, Virciglio said he foresees opportunities to renovate other stores.